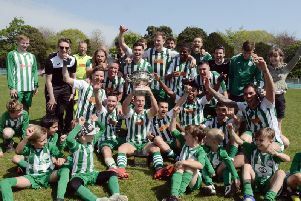 The Rocks begin life back in the Isthmian League on Saturday with the management insisting: Promotion is the aim. Boss Jack Pearce and coach Robbie Blake are happy with how the squad are shaping up ahead of the big kick-off and are pleased with the effort put in by the players in pre-season friendlies and training. The Rocks ended their build-up with a 3-2 win at Gosport last Friday, new loan recruit Dan Smith scoring two and Calvin Davies getting his second goal of pre-season. That gave them three wins from five friendlies and the bosses are content, but are not going overboard. They begin their Bostik premier season at Haringey on Saturday then host Merstham on Tuesday. Left-back Archie Edwards – a former Charlton player who had a brief but successful loan spell at Nyewood Lane last season – is set to join up with the squad at Haringey after finding himself without a club. Whether he remains with the Rocks longer term remains to be seen. Keeper Dan Lincoln is staying at Bognor – at least for now – while centre-half Corey Heath could be in a matchday squad for the first time in nearly a year, but on the bench rather than starting. Pompey youngster Bradley Lethbridge is on tour with the Blues’ academy and will miss the first league match but is due back with the Rocks in time for Tuesday’s home opener. Long-serving utility man Harvey Whyte will be captain – and could be freed up to play farther forward than right-back if Edwards slots in at left-back and Calvin Davies switches to right-back. Smith and Jimmy Muitt, both of whom have impressed in pre-season, are set to join forces up front. Pearce said it was a tough division to predict, with no one team looking obvious title contenders. “It could be a topsy-turvy season for results,” he said. “We must make sure we keep pace. “I want to settle on a squad of 17 and I do feel promotion is achievable. But it will take a little while to work out where we sit in the scheme of things. Coach Blake has been heartened by what he has seen from the squad in the six-week pre-season programme. “It was good to finish the friendlies with a win at Gosport, a team who play at the same level as us, and I was delighted for Smudger (Dan Smith) to get a couple. “He along with Jimmy Muitt and Brad Lethbridge gives us nice variety up front although we’re without Brad for the first game. “In my view we have a good squad who are hungry and who work hard. Blake was keen not to make any bold predictions about how the season would pan out. * The Rocks have entered the Alan Turvey Trophy (the league cup for Bostik teams) for the first time in a number of years and will play Whitehawk or Three Bridges in the second round on Tuesday, September 18.